Shazam! remained the top movie at the box office on Friday, holding off Hellboy in the process. 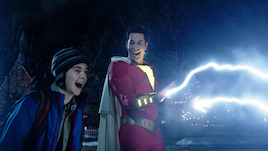 Shazam pulled in $6.3 million on Friday, lifting its total to $76.1 million. Hellboy was second with $4.9 million in its opening day. Captain Marvel was seventh with $2.2 million, pushing its total to $380.1 million.